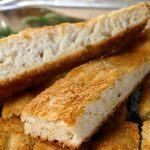 This breadstick recipe resembles much of the Pizza Hut breadsticks, as they look similar, tasty and very easy to make. To make these breadsticks, I used my crusty pizza recipe. You only need to use one portion of the pizza recipe (as it makes 2 pizza’s) but you can make one pizza and breadsticks from the original recipe. Assembly is easy as you don’t have to roll out each strand to make a breadstick, instead just spread out a ball of dough per instructions and you can achieve something similar to Pizza’s Huts style. Dip into hot spaghetti sauce for extra flavor! 3. Divide the dough into 2 equal portions and mold into balls. Dredge the bottom of each ball of dough well into the cornmeal and then transfer dough to well greased 13 by 9-inch pyrex pan. 4. Brush the top with olive oil and sprinkle with parmesan cheese and garlic powder. 5. Bake in a pre-heated 380 degrees F oven for 15-20 min or until golden. This breadstick recipe resembles much of Pizza Hut breadsticks, as they look similar. Tasty and very easy to make. Divide the dough into 2 equal portions and mold into balls. Dredge the bottom of each ball of dough well into the cornmeal and then transfer dough to well greased 13 by 9-inch pyrex pan. Brush the top with olive oil and sprinkle with parmesan cheese and garlic powder. Bake in a pre-heated 380 degrees F oven for 15-20 min or until golden.